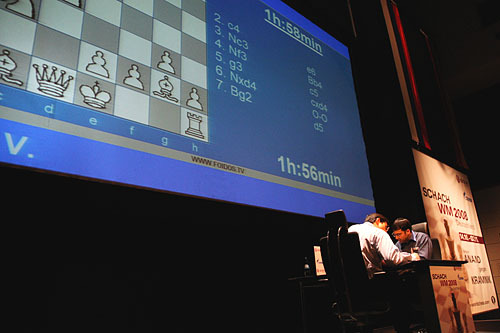 ChessMaine: WCC Bonn Round 10: Not So Fast! WCC Bonn Round 10: Not So Fast! 10.27.08 It's the stuff champions are made of--in a absolute do-or-die situation Kramnik tallied his first win of the match to continue to fight on for the title of World Chess Champion. 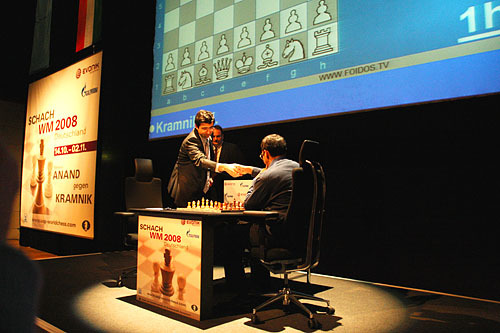 Anand essayed a Nimzo-Indian in response to Kramnik's 1. d4 but ran into trouble both on the board and on the clock. It ain't over yet!